Next to mobile slots, mobile roulette is also one of the most popular casino games on the go compatible with various mobile operating systems and available at almost all mobile casinos. The game differs in terms of features, rules and graphics from one mobile casino software provider to another and because of its popularity it has many different variants. The most popular mobile roulette variants on the move are European and American roulette. Mobile roulette is played according to the standard roulette rules, although they might slightly vary between different variants. The game play is also the same as that of online roulette; the difference is that playing mobile roulette is very convenient and you can take the game with you wherever you are. Read on to find out more about how to play the game on mobile devices and about the software providers that create mobile roulette. In addition, consider the roulette tips before playing. Playing mobile roulette is very easy, simple and convenient. In order to play the game, you need to sign up with a good mobile casino and make a real money deposit. Then tap on the game and it should load fast. By switching the smart phone to horizontal landscape, you will have a better viewing area of the game. Once mobile roulette loads, tap on the numbers you wish to bet on and place a chip. Then the ball will start spinning in the wheel and it will eventually land on a number. That number is the winner. Winning bets are paid according to the type of bet and bet size. 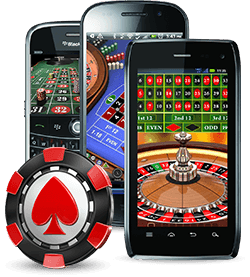 Even though the game is displayed on a smaller viewing area compared to that of online roulette, mobile roulette has all the features necessary to function and it offers seamless game play on the go. Different mobile casino software providers create different mobile roulette games and they mainly differ in terms of rules and graphics. The following are the mobile roulette games created by Microgaming, Playtech and Betsoft Gaming and the mobile casinos where you can play the games on the go. Microgaming created a European-style mobile roulette game compatible with devices such as iPhone, iPad as well as Android mobile devices. The game has one green zero and black and red numbered pockets from 1 to 36. The return to player rate of the game is between 97% and 98%. The casinos are compatible with iOS and Android mobile smart phones and tablets and they are safe, trustworthy and have excellent reputation. Playtech version of mobile roulette also has one zero and numbers 1-36. The game has nice graphics and sound and it is suitable for different mobile smart phones and tablets. The return to player rate is over 97%. Bet365 Mobile Casino and EuroGrand Mobile Casino offer mobile roulette from Playtech and the casinos are easy to access from almost all mobile devices, especially those that use iOS and Android mobile operating systems. The casinos are also reputable and have excellent player support service. Betsoft Gaming’s mobile roulette features impressive 3D graphics, especially when the wheel spins. Players can place different types of bets and the game offers the La Partage rule. The minimum and maximum table- bet limit is 1 and 100 units respectively. The maximum straight up bet is 25 units. A European-style roulette, the game features one zero and numbers from 1 and 36. The return to player rate is 97%. Mobile roulette from Betsoft Gaming can be played at Drake Mobile Casino and Video Slots Mobile Casino. The former casino welcomes mobile roulette fans from the United States. Both mobile casinos are reputable and use the best safety measures. They are also compatible with iPhones, iPads and Android powered mobile devices. Sign up with a reputable and safe mobile casino that offers roulette on the go. Set a bankroll and stick to it. Before playing, decide how much you want to spend on each bet. Practice the game for free and test various betting strategies before switching to real money play. To prolong your game play and maintain your bankroll, place even chance bets. Switch between different roulette betting strategies if you are losing. Never chase winning or losing streaks. Cash out whatever amount you win which is above your bankroll. Never play under the influence of alcohol.